Design is often an underestimated element that belongs to a strong strategy. You can have what looks like the best marketing plan on paper but if your visual branding isn’t on par, nobody will be doing any double taking, clicking through, or purchasing what you have to sell. We’re on a mission to help you unlock the next level of growth for your brand. Today, we’re helping you achieve that through understanding the 5 Design Issues Resolved In Your Content Marketing. What does that mean? We’ll show you how to put together a better design for your content marketing. Don’t be alarmed though! You don’t need to be a graphic designer to really get these tips and implement them. So read up and drop a comment below if you have any questions! Ever notice how many brands in the same field seem to be using the same popular stock images. These vary from trendy architectural structure or a really nice picture of a donut? We have, and it gets old! That being said, it’s time for you to go against the flow by adding in your brand’s uniqueness and personal touch. With tools like Canva & Over App, you can easily take that stock photo (or not) and bring in elements that’ll incorporate your brand’s colors. So maybe you take that picture you really liked of a meal for your food blog but you overlay some text and shapes to make it your own. It takes 1-minute of your time to leave a lasting impression through memorable visuals. We recommend, however, taking your own photos. Don’t let a digital camera scare you. iPhones take great photos these days. Plan out a photo that will really relay what you’re trying to convey in your food blog, snap it, edit it, and post it! This will really set you apart. You know when you’re scrolling through Instagram or reading a new blogger’s blog and all of a sudden what’s supposed to be 5 paragraphs is just one massive blob? Ya, we hate it too! Rule of thumb, whether you’re building out your next caption or 1,500-word blog post – break it up. We repeat. BREAK. IT. UP. Not only does breaking up your text make it easier to read but it aesthetically it looks so much better. If you’re writing a blog, take advantage of subheadings, avoid extra wide paragraphs, and try your hardest to be clear and concise. Just because today you like the color purple and tomorrow you like the color yellow it doesn’t mean they both belong in your brand’s content design. Think of your brand as an incredibly confident person who knows exactly what they want and who they are, with little to no variation. Consistent branding creates an identifiable personality for the brand, one that is easily distinguishable and recognizable.. Even though your brand may not literally be a person, think of it like one. Every artwork you put out with your content is an extension of your brand’s expression & personality. Ask yourself, does this match up with my brand or is it confusing & off-brand? Deciding on 1 to 3 colors for your brand and sprinkling them in is a simple and solid starting point to create a cohesive feel. What does data have to do with something as artistic as design? Everything, here’s why. The data from your blog, ads, social media etc can help you piece together patterns. For example, when looking at your top performing posts on Instagram over the course of a 1-year period you should look at the top 9 posts from a variety of angles. One of those angles is design. We look for any patterns when it comes to photography style, colors, filters, props, angles, or even outfits used. This approach works across the board with anything else online that you can pull data from. We encourage you to do the same for your highest converting ads or most-clicked-on blogs and see if there’s a visual pattern to them. Say you own a spa. Using colors like red as your most dominant color doesn’t exude the relaxing atmosphere you want your potential clients to feel. Oftentimes, people will select colors based on their own personal preference. The thing is, your personal preference may not align with the psychological meaning behind each color. 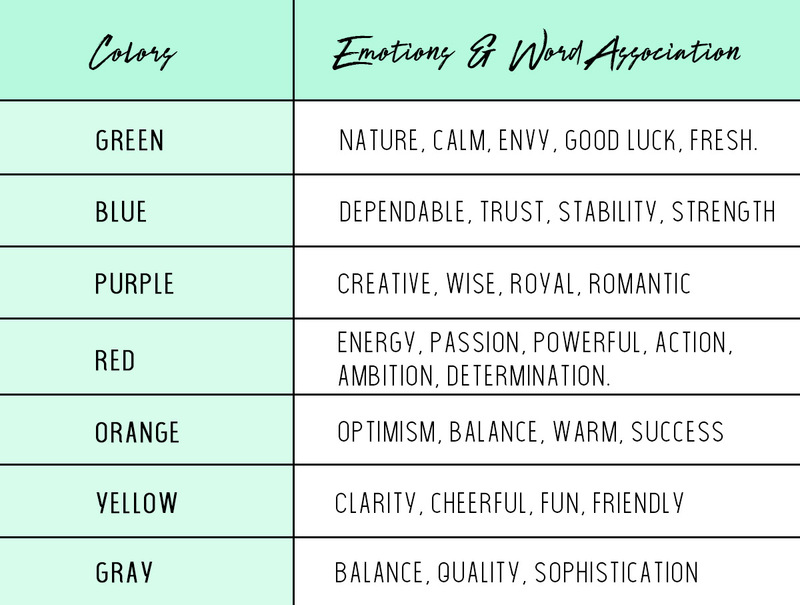 So we’ve taken the time to help you understand the emotions associated with colors. Bookmark this article so you can always come back to it later when you need to. At Creative Label, we basically eat, sleep, and breathe design. If you’re having a hard time connecting the dots and executing a clear & branded content marketing strategy just send us an email at info@itscreativelabel.com. Let us help you with what we do best while you focus on what you do best. We would love to help you bring your branding to life!